The following animated villains fall into such a category. They aren’t evil, but they are antagonists in one way or another, and they create obstacles that the heroes must overcome. Be warned, there will be some spoilers ahead. Studio Ghibli – and Hayao Miyazaki in particular – have a knack for making complicated antagonists. Rarely are they evil for the sake of being evil. In fact, they usually aren’t evil at all. And Donald Curtis is a prime example of a character who simply has a conflict of interest with the hero. Donald Curtis is an expert fighter pilot, but he has bigger ambitions. He dreams of becoming a Hollywood star and the President of the United States! He’s a hopeless romantic, and falls in love with just about every woman he sees (but he’s no womanizer). So if opportunity knocks for Curtis to make a name for himself, and win the heart of a woman, he takes it. It just so happens that said opportunity comes knocking in the form of air pirates, who need Curtis’ help to shoot down bounty hunter Porco Rosso, who’s been a thorn in their side for some time. Through the course of the film, Curtis goes from Porco’s rival to something along the lines of a frenemy. And when all is said and done, even Curtis gets a happy ending (though he doesn’t become president). Although Skinner is the more sinister antagonist of Ratatouille, he’s second banana to the film’s true big bad, Anton Ego. Ego is the primary obstacle for Remy to overcome, not because he has it in for the little rat (Ego doesn’t even know Remy exists until the end), but their conflicting views of art and cooking serve as one of the film’s primary themes: Remy follows August Gustau’s mantra that “anyone can cook.” Ego, on the other hand, has grown so absorbed in his own pretentiousness that he simply writes off most artists. He no longer sees originality or inspiration in the world of cooking. 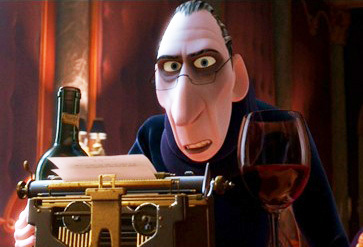 Anton Ego, a food critic, has grown something of a disdain for the artists he critiques. According to him, he simply “takes cooking seriously” but the truth is he’s lost faith in the art he once loved. His pretensions are put in question, however, when he partakes in a meal cooked by a most unlikely source. I know what you’re thinking, “Elsa’s not the villain, Hans is the villain!” Yes, Hans is the villain of Frozen, since he’s the only character in the movie with evil motives, and he serves some great thematic purposes. But Elsa is the main antagonist as far as the narrative is concerned. 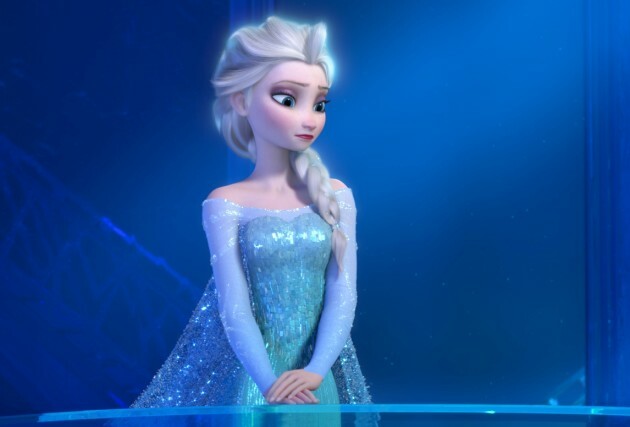 It’s Elsa who (unintentionally) creates the obstacles for Anna – the hero – to overcome. Elsa’s fears create the film’s dilemmas, and it’s Elsa’s (frozen) heart that needs to be changed in order to bring a happy ending. Elsa and Anna are the driving forces of Frozen. Anna being the protagonist, and Elsa her (sympathetic) antagonist. Most Disney villains are evil because, well, their movie needs a villain. But what makes Elsa a far more effective and unique character is that she’s every bit as kind and well-meaning as the film’s heroine. But she’s scared, confused and uncertain. That’s what creates the film’s dilemmas. And that’s what makes Elsa a compelling character. She’s probably the most human character in the Disney canon. Again, Miyazaki loves him some morally-ambiguous villains. And few of them showcase this more than Lady Eboshi. Princess Mononoke is a man vs. nature story. 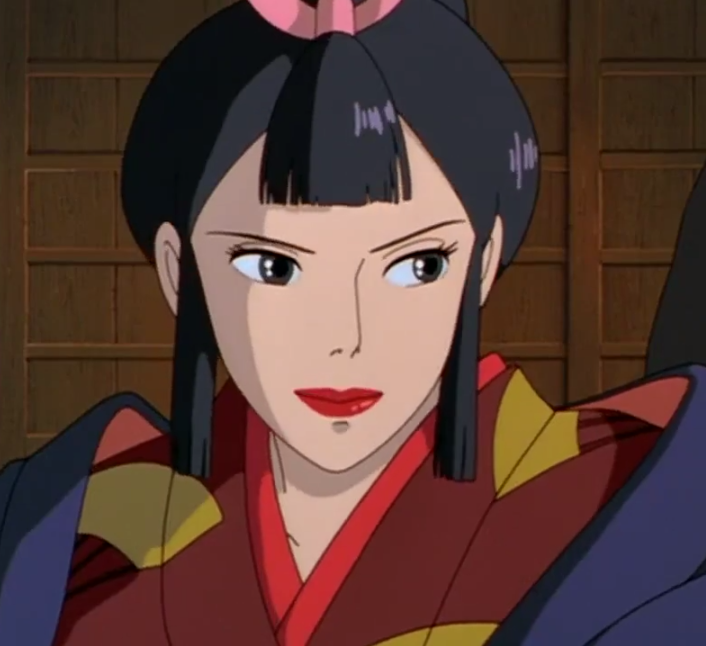 But unlike, say, Avatar – in which the villains are made out to be a bunch of guys who want to blow up trees simply because they want to blow something up – Miyazaki instead created an infinitely more compelling antagonist in the form of Lady Eboshi. Lady Eboshi is destroying an ancient forest, and in doing so, has started a war between the people of her ‘Iron Town’ and the animal gods of the forest. But she’s not doing it out of spite, or because she has an inexplicable hatred of nature (she even feels remorse for many of her actions), she’s doing it because she believes it’s what needs to be done for the further development of her people. She’s a firm believer in industry and advancement, and if she thinks knocking down a few trees can help her cause, then she’s going to do it. 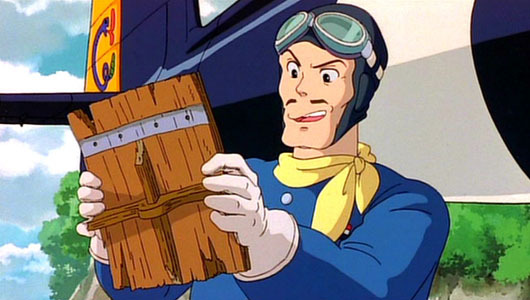 Of course, the list is topped by another Miyazaki character. Noface is a spirit of loneliness. He has no friends, no family, and even the strange entities who inhabit the world of Spirited Away find him alien. Noface is also a blank slate. He reflects the emotions and personalities of those around him, leaving him to search for someone who can show him love and friendship. He finds such a someone in the film’s heroine, Chihiro. Through the course of the film, she transforms from a spoiled, apathetic child to a selfless hero. But he sees her inner strengths before anyone else. He wishes to be her friend, but being the embodiment of loneliness, he doesn’t know how. When he enters the bathhouse and he becomes surrounded by greedy and selfish people, he reflects that, and his entire being becomes skewed, transforming him into a gluttonous monstrosity. Although some have very misguided ideas about why Noface stalks Chihiro, the truth is Noface is a childlike creature who only wants to be loved. He’s alone, sad, frightened and confused. The negative influences of the world around him turn him into a beast. But kindness, understanding and friendship might just save him. Lady Eboshi is a fantastic character and it is her complexity that stops Princess Mononoke from becoming just another commonplace man vs. nature narrative. Her means might be a bit too thoughtless, but she is blatantly doing what she does for the good of a whole lot of people who would otherwise lead some pretty miserable lives. It is the kind of movie where it is impossible to pick a side to root for, so you just sit back and reflect on what you are seeing. The other choices are also great! 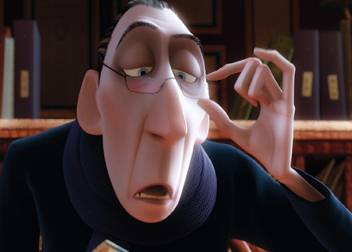 Only Pixar could make an astounding animated movie where a food critic is an antagonist not because he is cartoonishingly evil, but because his criticism is brutal. 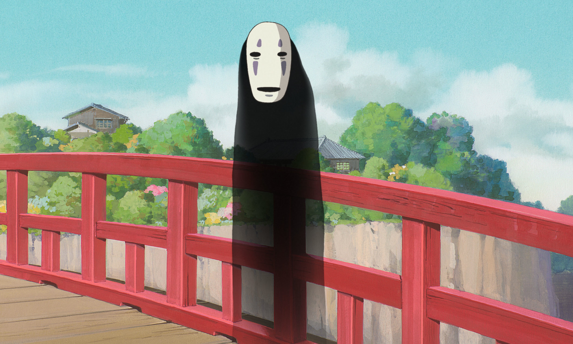 As for Noface, here goes a quick story about how our minds are so set on looking for a good and bad side on every movie or story (a direct reflexion of the overall shallow character design that is pretty much everywhere) that sometimes we overlook the complexities of works from guys like Miyazaki. I showed Spirited Away to my English students, who are on the 16-18 age range, and when the movie ended I asked them a bunch of questions about it. And although they had some pretty nice observations to make, not one of them could get what exactly was up with Noface. Nobody could articulate his motivation; they just wrote him off as a crazy evil spirit or something of the sort. By asking questions, I tried to induce them to discover that he just wanted love/attention, but was clearly clueless on how to achieve that, and that Chihiro’s generosity touched him deeply because he was not used to it. I couldn’t make them figure that out for themselves, unfortunately; but when I speelled it out to them they had that “mind=blown” look on their faces and started raving even more about how awesome the movie had been. One of them (she is an overly sensitive girl that one) was so touched by his loneliness that she almost started crying. Lady Eboshi is one of the aspects of Princess Mononoke that makes the film so special. It wouldn’t be the same movie without her for sure. Anton Ego is probably my favorite Pixar character (except maybe Buzz Lightyear). Ratatouille is one of my favorite Pixar movies largely because of him. It really is a shame how many people have the wrong idea about Noface. So many people believe him to just be some insane villain (or worse, a lot of people seem to think he’s some kind of pervert allegory, which is not only eye-rollingly misguided, but also completely ignores the whole side story with the bathhouse driving him crazy). He’s actually a much more tragic and sympathetic character. And your students’ reactions once you informed them of Noface’s nature sounds appropriate.